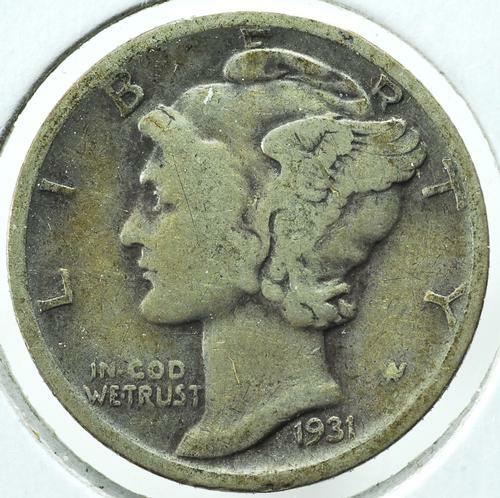 After a 25-year run, the Barber dime was replaced in 1916 by a coin known variously as the Winged Liberty Head, Winged Cap, or Mercury dime. The coin was designed by sculptor Adolph Alexander Weinman, with engraving help from George Morgan, the designer of the 1878 Morgan silver dollar. The dime’s design was the result of an open competition, with much better results than a similar contest attempted in 1892. Weinman actually won two commissions from the U.S. Treasury, one for the dime and another for the Liberty Walking half dollar. The obverse of Weinman’s dime depicts the head and neck of Lady Liberty, who Weinman modeled after Elsie Stevens, the wife of poet Wallace Stevens. Her winged cap, which resembles a cloche, is supposed to symbolize freedom of thought, so the coin’s association with the mythical Mercury is incorrect. While the coin’s obverse is routinely misidentified, its reverse probably strikes casual contemporary viewers as unremarkable. At a glance, one sees what appears to be a Roman column backed by olive branches. Upon closer inspection, though, the column turns out to be a bundle of sticks, and there’s an ax blade projecting out from the bundle and facing left. Known as a fasces, this ancient Roman symbol of power was a thinly veiled message to the nation’s enemies in Europe that they could have peace (the olive branches) or a fight (the fasces), but the U.S. was prepared for both. Mercury dimes, as they are still inaccurately called, were minted through 1945 with only a few interruptions—none were struck in 1922 or 1932. The most desirable dimes are ones whose fasces bands (the three horizontal pairs of straps holding the sticks together) are clearly defined. Denver dimes from 1916 had the lowest mintage, so those dimes tend to cost far more than ones from any other year. Another sought-after dime is the 2-over-1 overdate from 1942—both the Philadelphia and Denver mints made this error, but the Philly goof is especially pronounced. And if someone offers you a 1923 or 1930 dime minted in Denver? It’s a fake. After the death of President Franklin D. Roosevelt in 1945, Weinman’s dime was replaced by a new one designed by mint engraver John R. Sinnock. Roosevelt dimes remain in circulation to this day.